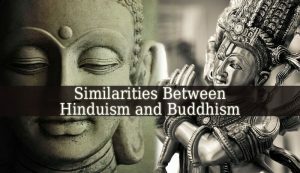 Hinduism And Buddhism Are Similar In That Both Religions Have The Same Goals – Although they are two different religions, they have numerous characteristics in common. This is mostly due to the fact that Buddhism was created as response to Hinduism. But keeping some basic aspects of the oldest religion. Beside having the same goals. These two major religions share 4 other similarities. Which are important enough to be mentioned. This is an important belief that Buddhism decided to adopt from Hinduism. The cycle or reincarnation and rebirth represent the core of both religions. Although trough different methods, but both Hindus and Buddhists try to escape this cycle. Their goal is to avoid rebirth and reincarnation. Through achieving liberation or spiritual awakening. Both Hindus and Buddhists practice meditation on a sacred level, daily. They consider it one of the most effective practices to achieve liberation or Spiritual Enlightenment. But meanwhile Buddhists meditate for mindfulness. The Hindus meditate on different deities. The goals of both religions is the same. But called differently. Therefore, in Buddhism it is enlightenment. In Hinduism it is liberation or awareness. But these terms have the same meaning. Their goal is to avoid rebirth and to the spiritual afterlife. Buddhists want to escape suffering. And Hindus want to escape rebirth and bad karma. Non-attachment is a basic rule for both religions. The more you are attached to the material world, the harder it will be to achieve enlightenment. Therefore, both Hindus and Buddhists avoid attachment to material possessions and even to emotions. Attachment interferes with their Spiritual Growth. In conclusion, these are the major similarities between these two wonderful and powerful religions. Both of them have millions of followers, not only in Asia, but all over the world. And they all share these aspects of their religions. Previous Where Do Atheism And Christianity Agree And Disagree On Views Of The Origin Of The Universe?